Extension Blog: Opening day ! This was it then, the official opening day, Friday 30th March 2018. 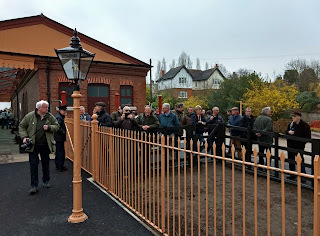 As most of the tickets had been sold on line, there was only a small queue outside the booking office, and one of our volunteers bought ticket No. 14, full price, for a souvenir. That was very kind of him, as he has free travel but felt that he ought to support the railway. The day started grey and misty, and rain was forecast for later in the day. 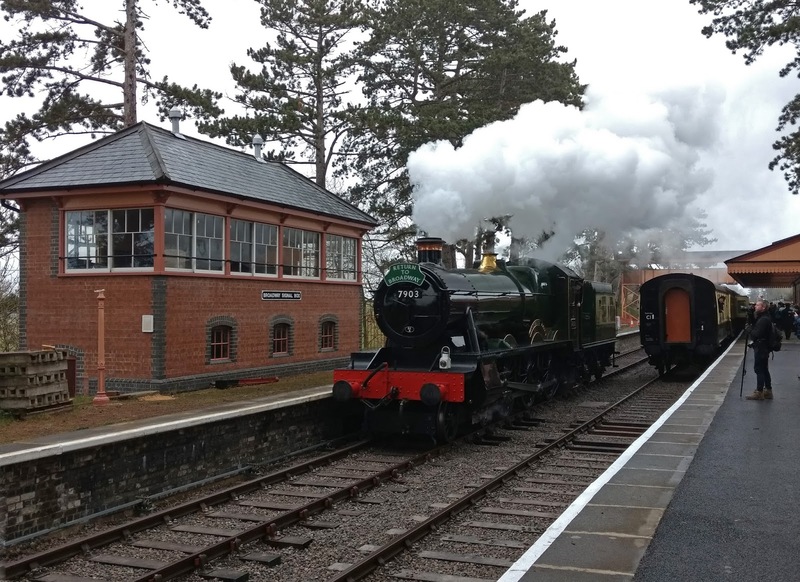 We were very lucky that it stayed dry for the first two trains, and were able to perform the ceremony without a hitch. Everything went very smoothly. 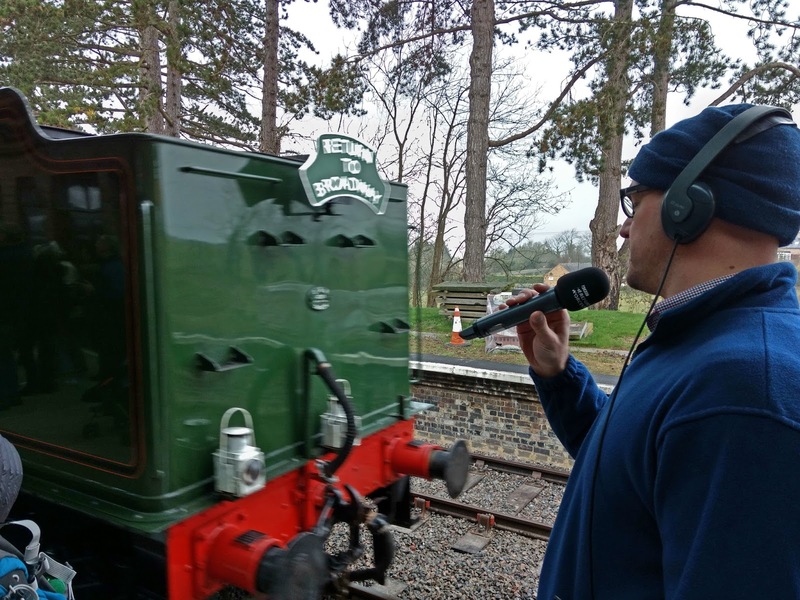 The first thing we met, after delivering the clock just acquired for the booking office, was BBC Radio Hereford and Worcester doing a live broadcast. A wall of photographers was assembled outside the gate - you get a view for free here. 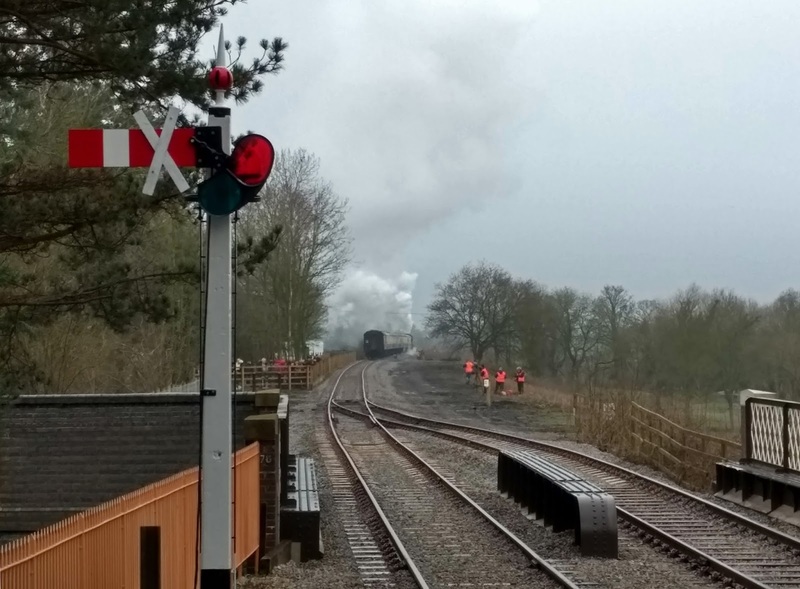 Shortly afterwards Foremarke Hall reappeared from behind the train, and chugged past the signal box with steam on. 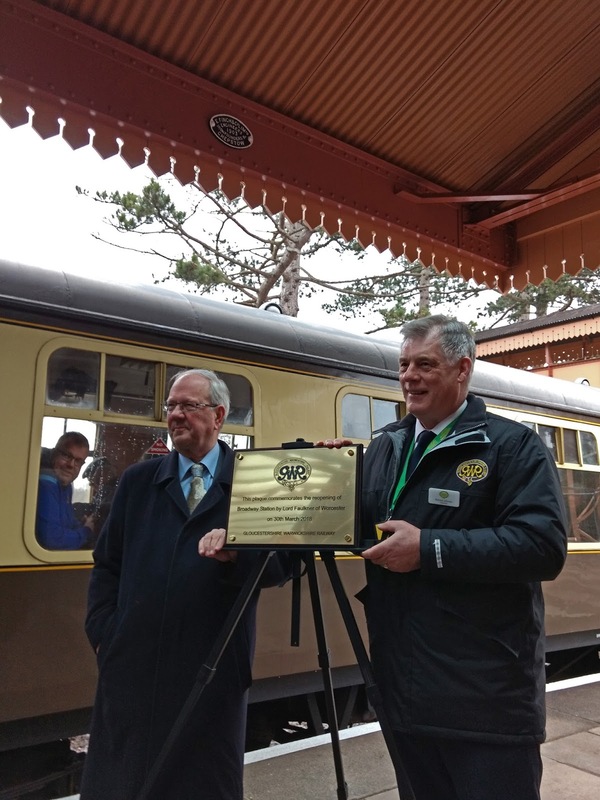 While the loco went about its business running round ready for the inaugural 09.40 departure, a specially made brass plaque was unveiled by Lord Faulkner of Worcester and our own plc chairman Richard Johnson. By coincidence, the ceremony was held under the original E Finch of Chepstow worksplate up in the canopy. The original canopy was constructed in 1903, and the new station with the authentic reproduction in 2018, 114 years later. With Foremarke Hall back in front of the train and now facing in the right direction, a small crowd formed at the platform end to photograph it. The gleaming paintwork on this locomotive is quite striking, it even elicited a comment from a member of the public about it. The fire on the footplate is burning brightly, ready for the departure in a matter of minutes. 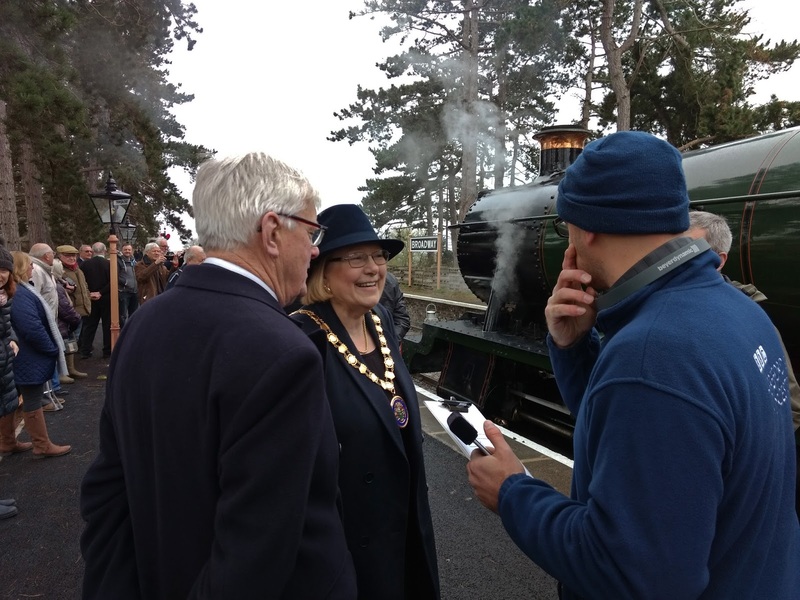 BBC Radio Hereford and Worcester undertook a number of interviews, here with the Chairman of Wychavon District Council Liz Eyre, an enthusiastic supporter of our line coming back to Broadway. 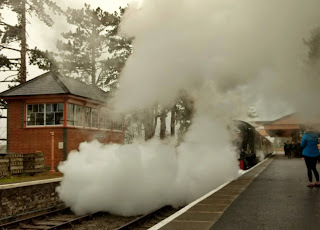 As the fireman of Foremarke Hall leans out to observe the stationmaster and guard of the train, the brakes are blown off ready for departure. A tight knot of video enthusiasts has formed at the platform end, ready to record every second of this historic departure from the newly rebuilt station. ... and here she - oh no, a huge cloud of steam appears! Everything is shrouded in mist, the videos recorded no more than a white fluffy wall. And then she was gone... 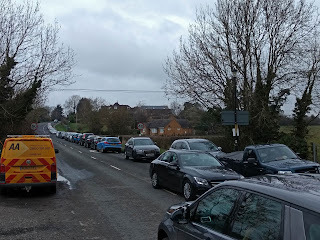 The 8 carriage train accelerated beyond the 10mph speed limit and down the hill towards Peasebrook. The first train was an exceptional departure, as the next one wasn't due out until 11.20. 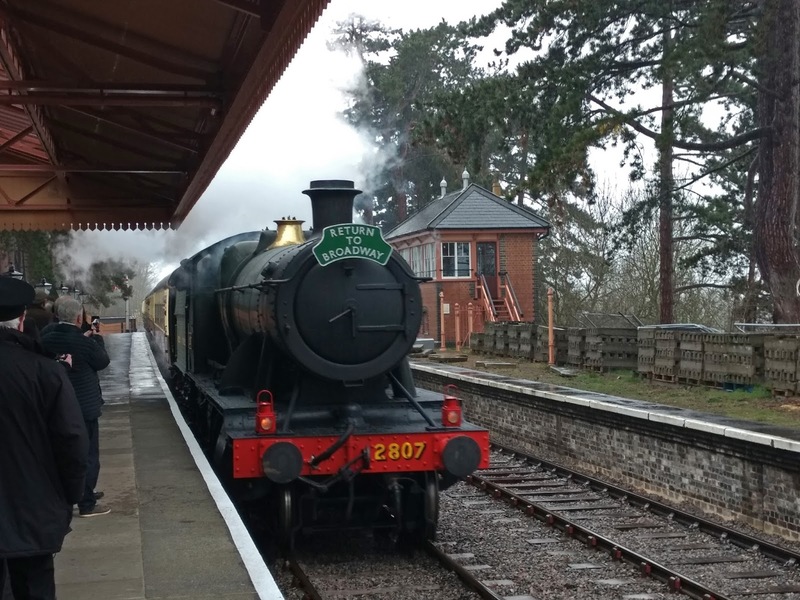 After a patient wait, Dimore Manor eventually arrived with the second train, which had set off from Toddington in the Cheltenham direction first. A quick trot down to station road saw Dinmore cross the road bridge on its way to the front of the train. 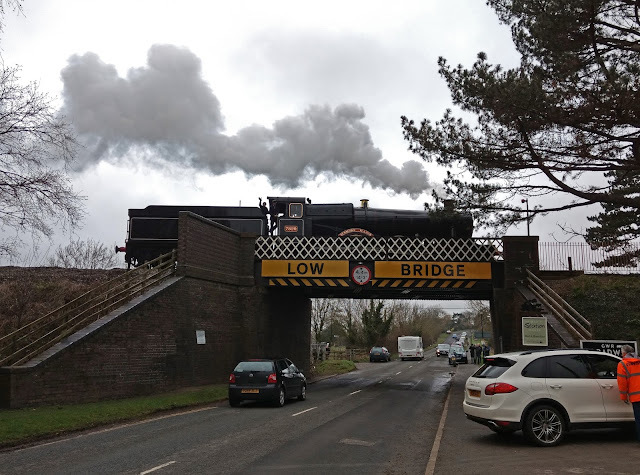 We got a cheery wave from the footplate crew, and it was wonderful to see steam trains running over this bridge again after so long. In the background you can see evidence of the interest shown in our reopening day - cars stretch almost out of sight. 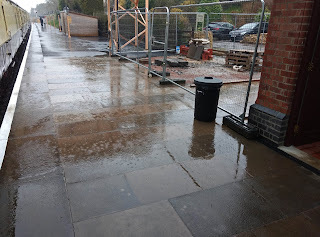 After August we should be able to park in the new council car park under the bridge and on the left, a very short walk to the station. Note that you cannot take your car up the station approach on the right, unless you are a local resident. The very few car parking spaces at the top are reserved for disabled drivers and a handful of station staff. The area on the corner of the building is also reserved for coaches and buses to turn round, so that has to be left free as well. 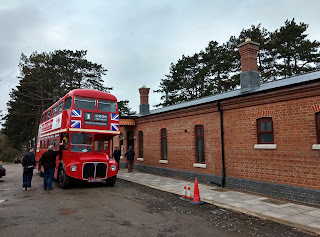 Talking of which, here is Graham's Routemaster parked outside the station. It shuttled up and down between the station, the centre of Broadway and the public car park on the Childswickham Road. 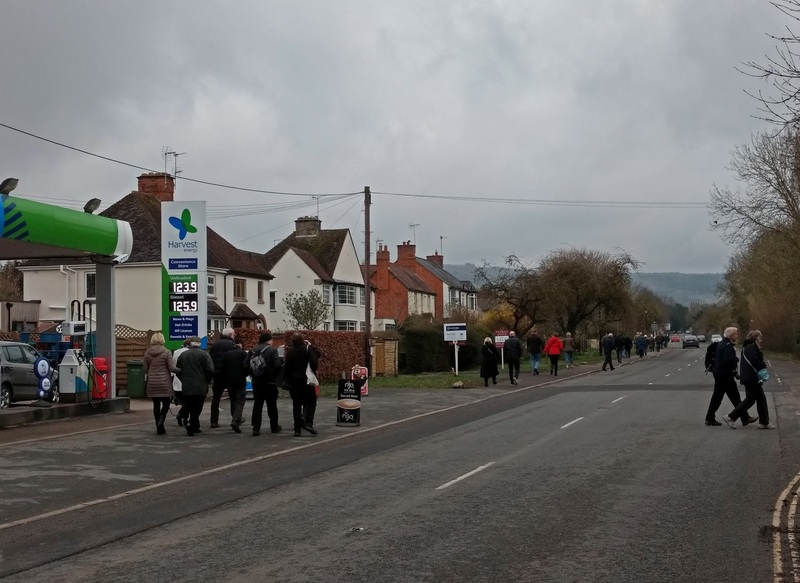 The bus was certainly well used, an was particularly welcome once it had started to rain. 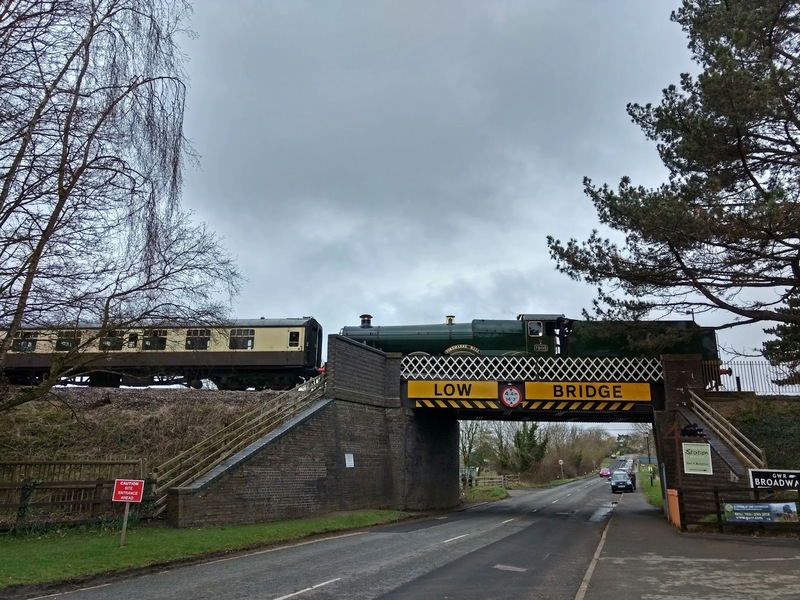 The next train in, due to leave at 12.20, was headed by Foremarke hall again, and we see it here crossing the road bridge before arriving at the station. 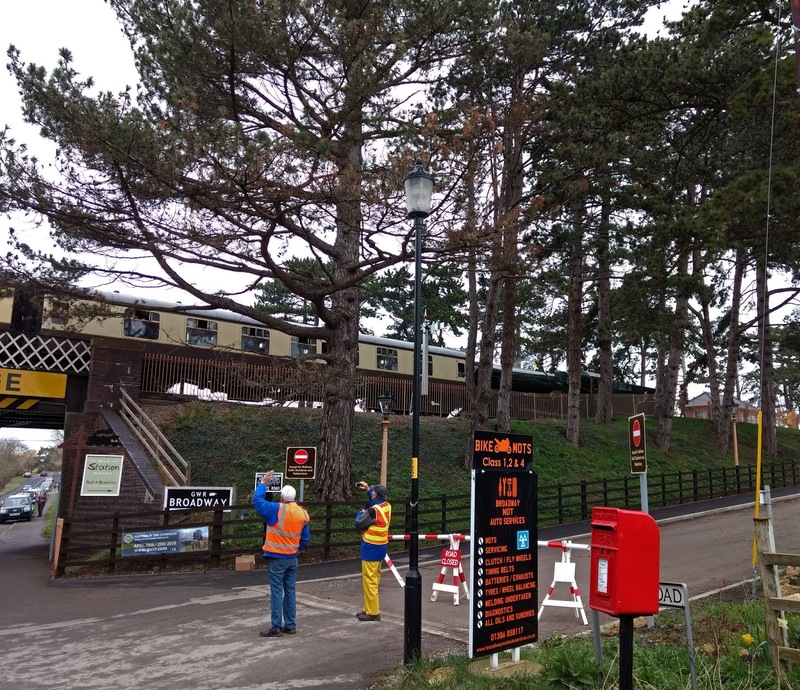 It was quite an unusual view to see it from the bottom of the drive, as it coasted past the old Scots pines along the platform. At the bottom of the drive were BAG members Pat and Vic on barrier duty, to make sure only authorised vehicles could venture up the station approach. New 'No Entry' signage left and right also makes this clear. We were particularly pleased to note that the passengers from the third train, after the opening departure with its guests a more routine passenger train, started to walk to Broadway up station road in quite large numbers. They were soon followed by your blogger on the way to his favourite Broadway pub for a piping hot bowl of warming Chili con Carne, and a pint of local Stanway beer. Bliss ! On the other side of the bridge is the row of parked cars up the road to Pennylands Bank. 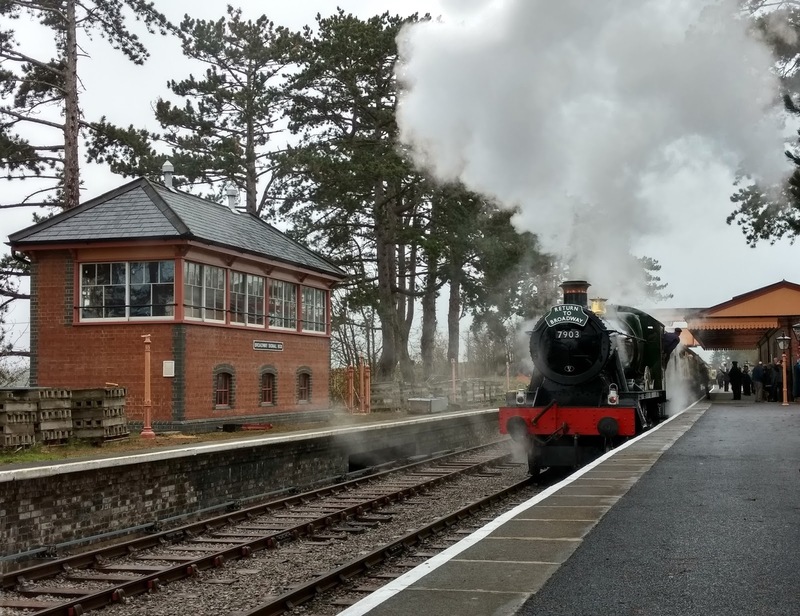 Many people cheerfully admitted they only came to watch the inaugural train, so in future there should be fewer of them, and belonging to actual passengers. Foremarke Hall about to pull away with the third train for the day can be seen here at the southern end of the loop, where the terrain can give rise to quite an imposing portrait of the locomotive. Note that this area is not open to the general public. This is the moment before departure of the third train out of Broadway, the 12.20. 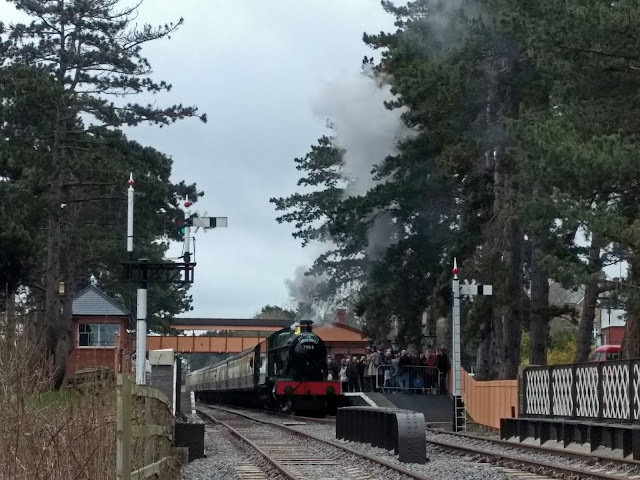 The intention was to take a video of this train, and we were doing quite well with the new smartphone, until it suddenly decided to do what it said on the box - it rang ! The video came to a dead stop just as the loco was passing. Dang ! Who knew that an incoming call would overrule the camera function? 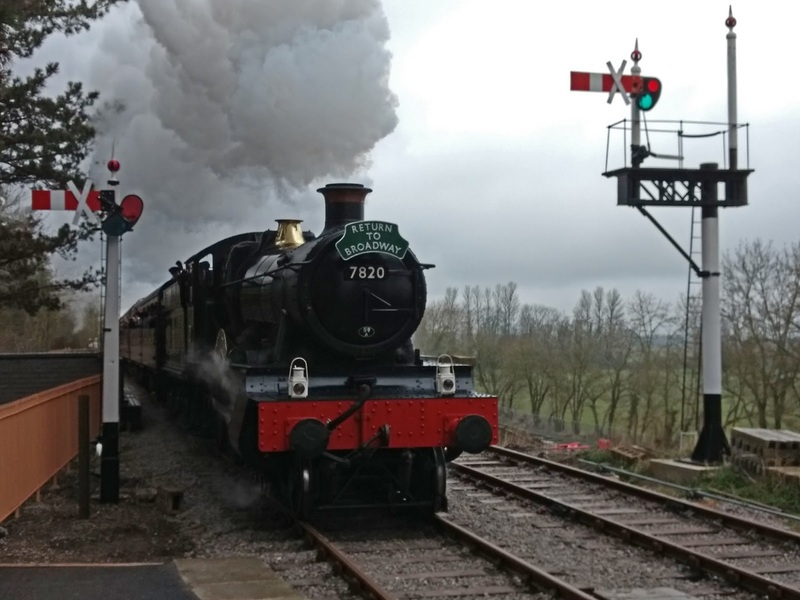 It's Dinmore Manor with the second train of the day. This one wasn't truncated, so enjoy. After lunch it was time for an interesting piece of station heritage. The booking hall needs a clock. 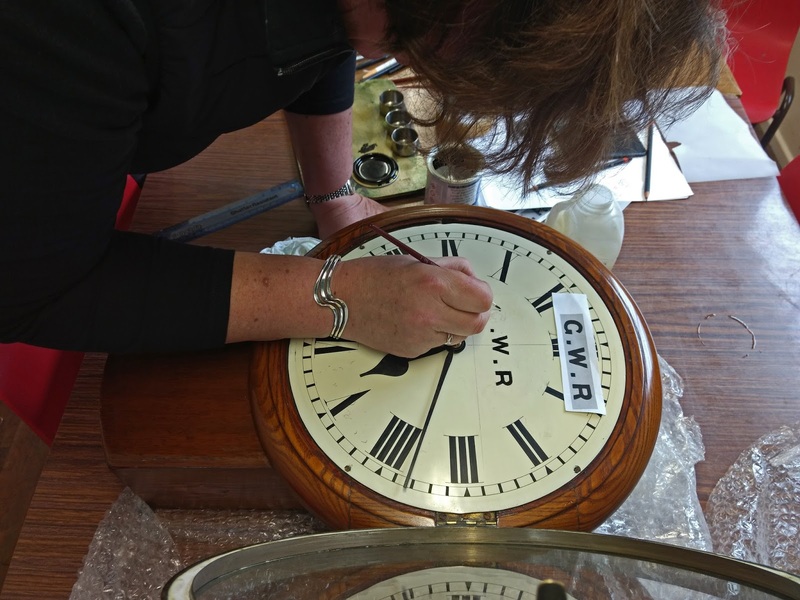 Unfortunately a genuine GWR drop case clock can fetch anything between £2000 and £2500. While a number of kind and generous blog watchers have offered to help with funding such heritage items, our worry was about the risk of theft from such a public space. 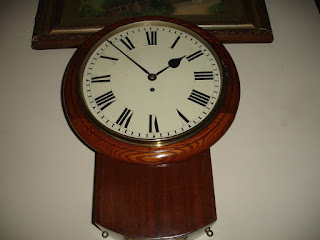 The advice was to buy a similar clock (the same manufacturer also made them for things like schools and factories, but those 3 letters suddenly add £2000 to the value of the clock) and add the letters ourselves. In this way we will have recreated the look, but not (we hope) the risk of theft, as it is not a genuine item. This was the look-alike clock selected, and purchased for a very reasonable sum. It is of the right period (1900) and the correct, unadorned style. WSR stalwart Robin White very kindly offered to letter it for us, and was keen to try out the new skills acquired after attending a sign writing course. Robin did this on the spot (clocks lettered while U wait) which was marvellous! For the font we consulted a local railway clock specialist, and a special matt, deeply cloured (and extra expensive) signwriting paint was used. We loved the result - thanks, Robin ! After a reviving cup of coffee - it was only 5 degrees C outside - we had a whim and decided to hang it up straight away. The pendulum is still at home - this went rather quicker than expected - so Sunday looks like the day it will start to run. It's an 8 day movement, so if the station staff remember to wind it up every Sunday it will work just fine, nothing more to do. And there it is. It looks just right. We also have a GWR route map and some posters for the walls - we will look at these once things have calmed down a bit. Towards mid afternoon 2807 finally showed its face at Broadway, and the train almost appeared less than full. The heavy rain which was now falling constantly no doubt played a part in this. This was the very wet view from under the northern end of the canopy. It even rained into the doorway of the Gents. However, this should hopefully soon be in the past, as there is a 6m canopy extension due to go in here, once we have saved up some money for it. It will stretch into the middle of the fenced-off area top right here, and will create a very useful circulating space for times of inclement weather such as today. Finally for today, our last picture shows the foundation stone of the new building. It's in carved sandstone, and is located half way along the platform side. It records the key dates of the building, just in case you thought it was the original. Every brick and stone, from below the platform foundations to the top of the chimneys, is new in this station. It took us 9 years, and was built entirely by volunteer labour. Hats off to the Broadway gang then ! PS Is nothing original then? 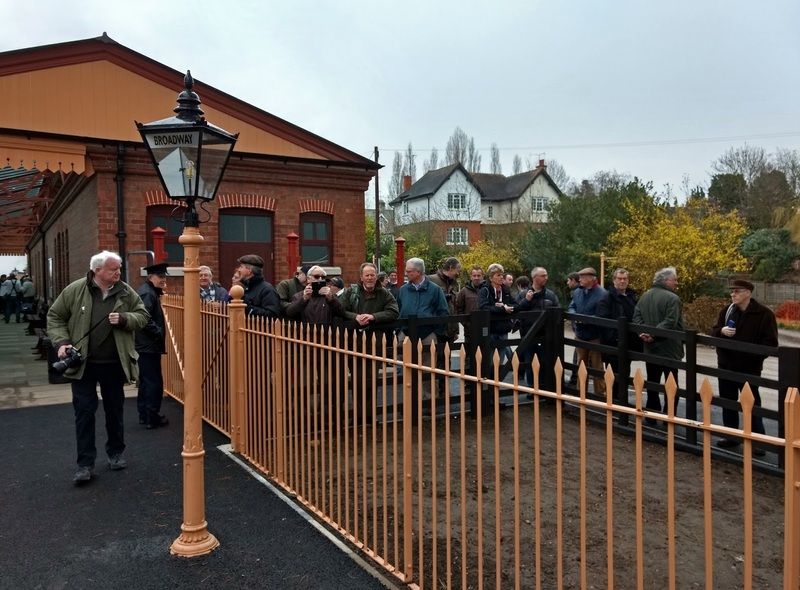 Well, we did manage to incorporate two original finds from the wreckage of the station demolition in November 1963: Two cast iron crowd barrier posts found under the dirt, and one cast iron finial from the P2 Gents modesty screen. Both were used to cast more of the same. And a final post scriptum - the Foremarke Hall video has completed uploading as this blog went to press. The video stops suddenly just as the loco is passing, leaving you to stare at the driver, frozen in time. Thanks for an excellent coverage of a special day. My parents used to live on Station Road, I wish they still did! My late mother would have loved to have seen what you saw today. 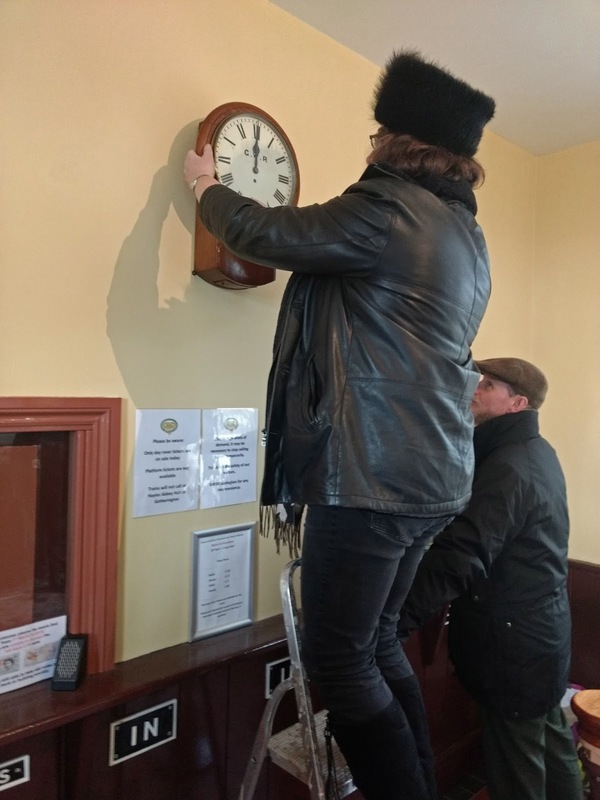 The clock in the booking hall looks just right and the numbers of punters even walking into Broadway on a miserable Good Friday must have gladdened the hearts of the shopkeepers! All the locos looked fine but 7903 must just live in a large Hornby box or something as it always seems immaculately turned out. We all know that Broadway Station is only around 60% or so complete and there is much work still to do but it's a great start. The foundation stone is exquisite in its simplicity. Jo, thank you for all your marvellous blogs. Well done to all at Broadway and again well done to you for the excellent blog. The picture of Foremark Hall on run round looks like it has a tender painted Chocolate and cream! It would be wonderful if a viewing platform could be built where you took the video's from so the rest of us could take some great photos and videos. Many thanks to everyone for your magnificent achievement . Wonderful blog and pictures. I shall save and savour them, and add them to my Broadway file. Yes, phones have the habit of doing what they are designed for unfortunately. When I lived in Spain, my phone was always destined to ring on my day off, until I learned to switch it off on that particular day of the week! Great clock in the Booking Hall. The lettering is truly authentic looking. Jo thank you for your wonderful blog interspersed with your usual bit of humour that makes it so enjoyable. I came especially for the opening ceremony and to ride on the first train which I shared with Robin White incidentally. I think the railway missed a trick though which probably cost it a lot of money and that was that the message given out both on the phone and in person on Wednesday (unless I totally misunderstood it) was that all ticket sales had been stopped and that it was doubtful that I would be able to get one on the day demand was so high. Well the first train was only 1/3 full and by the end of the day more or less empty. Were people put off? Yes I believe they were! Next time I hope the Railway will accept an online booking and deal with the tickets when the purchaser arrived on the railway. Supporters expected it to be very busy and would have been prepared to stand just they do on the big railway! The wrist band idea is fantastic but you had to show a ticket to get one if you had purchased online it could be an online receipt. Just a thought but I would not have missed it for the world rain or no rain which undoubtedly had an effect on the numbers in attendance. I concur, I stayed away partly due to weather and partly because of the message that the first day was sold out. The existing CCTV will be beefed up to cover all angles 24/7. But we won't tell you where the cameras are! Despite weather and no advance ticket, I went to Toddington and bought a ticket for the first train in behind 7820. Having watched its construction from afar (and 2 'in the flesh' visits) pulling in to that magnificent station was a wonderful experience. 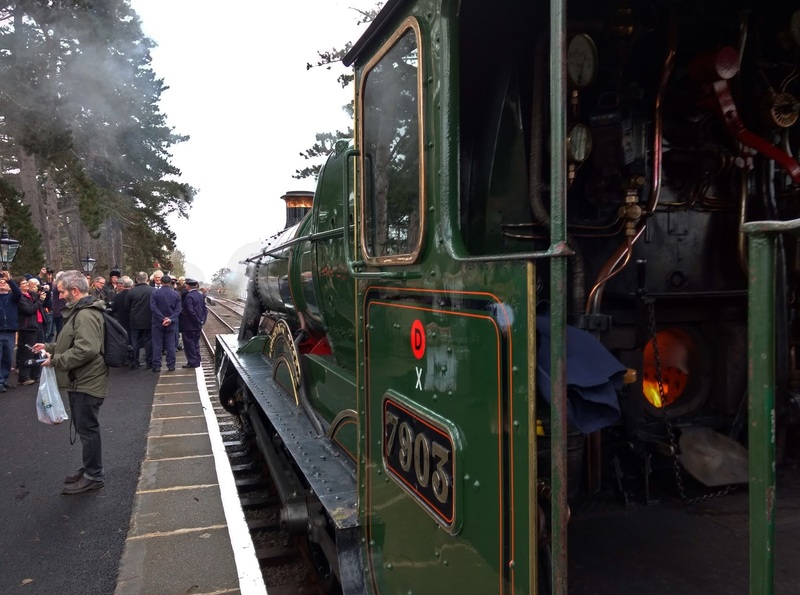 The locos were immaculate, as was the coaching stock and the overwhelming sense of joy and celebration was great on a day so bleak. I walked up to Broadway with a good few others, had some excellent chips and walked back in the deluge. The GWSR staff were all friendly and approachable, even when explaining for the umpteenth time why there were no steps on the Henley footbridge. A day to remember - one of those 'I was there' moments. Grateful thanks to all who made it happen. If there isn’t one already, a display of the story so far and future plans for the station would be a great feature and save a lot of explanation and repetition! I believe there is a mountain of information to construct a very saleable book or books one about Broadway and another about getting there. If Jo were to write it or be involved as editor I am sure it would be a good un! What can I say that hasn't been said already? 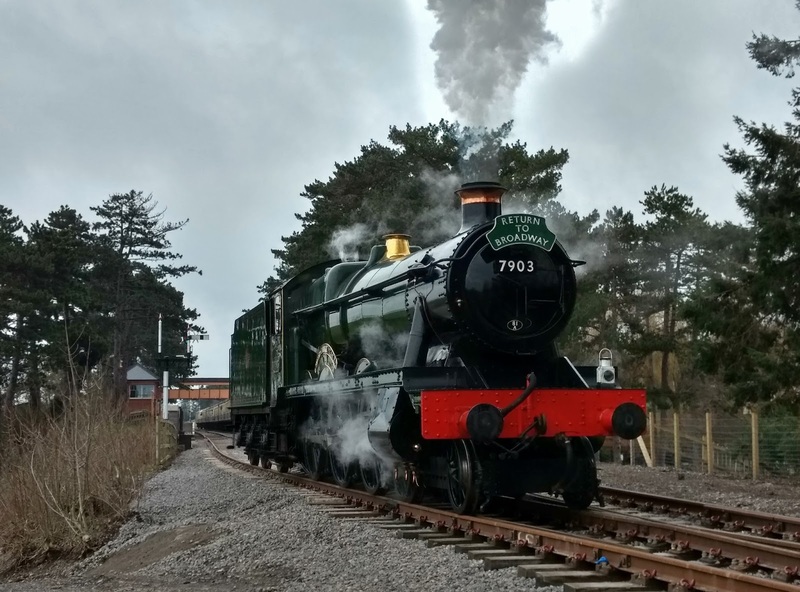 This rebuild is probably one of the best on any Heritage Railway in this country, in that it replicates so well what was there before. Surely there MUST be some reward given for all the hard work over the years by everyone involved. 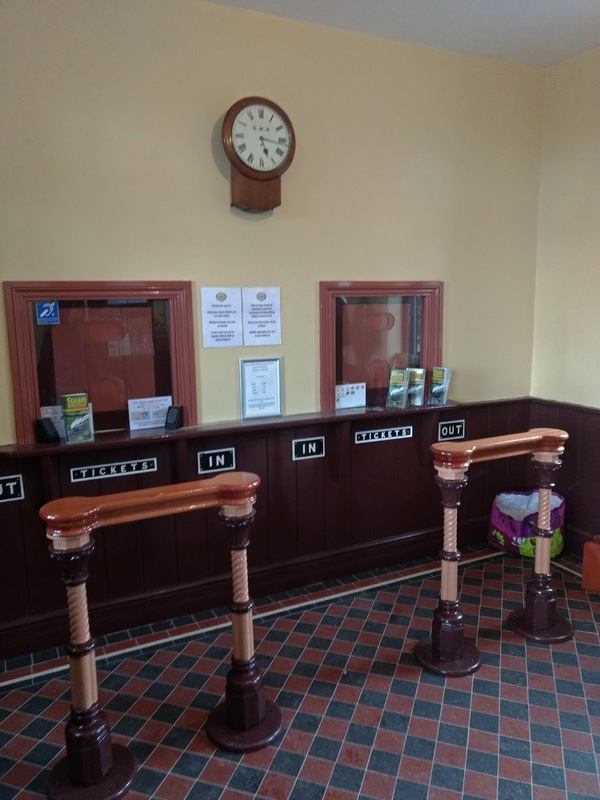 Just one niggle though - the photo of the booking office shows two laminated notices stuck to the wall between the booking windows. They're tacky and ruin the ambience of the place, given that the intention is to re-create an Edwardian station. Hopefully in time wooden leaflet dispensers and glass fronted notice boards will replace Perspex and lamination. But one doesn’t wish to over criticise what is essentially a wonderful recreation. 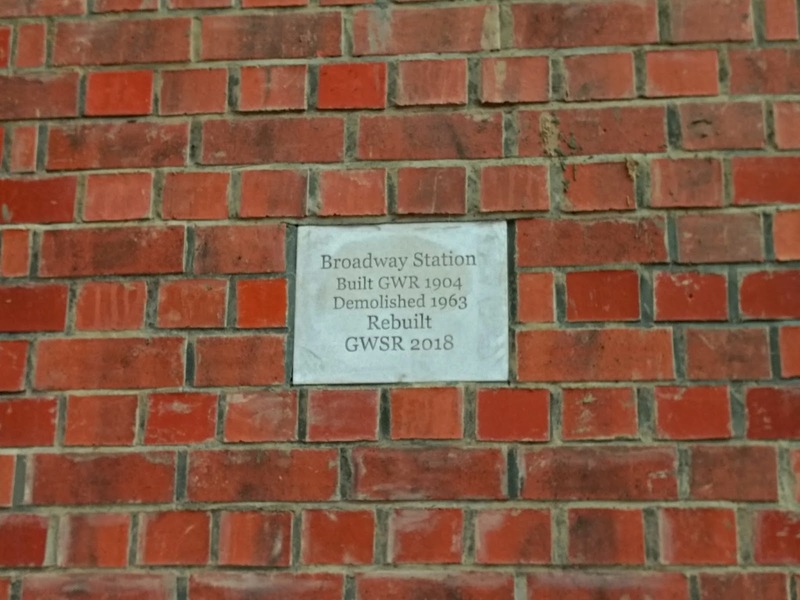 long live and a lot of success GWSR!! Glad you enjoy the read. I enjoyed my journey to Broadway yesterday. I was on the first train in behind Dinmore Manor. It was strange seeing all the local sights from the train, instead on the blog! All the teams deserve great thanks for their efforts. I will be back for another look when things have quietened down a bit. 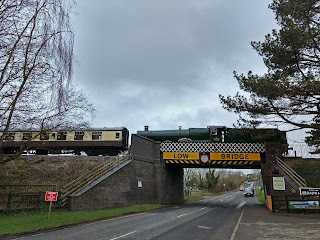 Thanks you so much, my family and i arrived at Broadway from Cheltenham on the 11.09 (Red Timetable) to an amazing sight of local landmarks and familiar sights that are usually seen only via the blog, (some thoughts here Mr. Fancote! ), even my 8 year old son said it was an epic day out! My last visit was two years ago, what an amazing difference to be seen. So....... When is the Honeybourne Are Group (HAG) going to open their blog spot? Maybe a clearance team from the North working its way south? (;-) Appreciate its a long way off, but a nice thought none the less!